Well cared for and updated Home offers a nice balance of old charm and new upgrades: Beautiful Tile Flooring, a Stone Fireplace flanked by modern book shelving and contemporary wall colors all work beautifully. In addition to the two bedrooms in the main house there is a detached guest bedroom with an electric wall-mount heater. Sedona's beautiful Red Rock Views can be enjoyed from from inside and outside. There is a Large Native Landscaped Back Yard and Patio with a Barbeque and sitting areas that perfect for entertaining and relaxing. 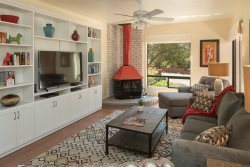 The desirable location is just minutes away from the Uptown Tourist Shops, Restaurants, and Hiking. This Home is a real Charmer and Great Vacation Home! Beautiful location. The property was spotless. The third outside bedroom was a nice addition. Overall a good restful stay.